While at the University of Georgia’s Southeast Georgia Research & Education Center, tour attendees were given a disease update from Dr. Bob Kemerait, Extension plant pathologist at the University of Georgia Tifton Campus. Kemerait said diseases are one of the biggest problems for peanut production in Georgia and many are caused by viruses, fungi and nematodes. At the research and education center in Midville, Dr. Kemerait and others are working to learn more about managing diseases in peanuts and giving that information to the farmer to help him grow a better crop. He said the research he is doing is two-fold; one to find an integrated management system for how to manage a virus and two, to do trials and experiments to evaluate what is available in terms of varieties and fungicides that can help growers better manage diseases. 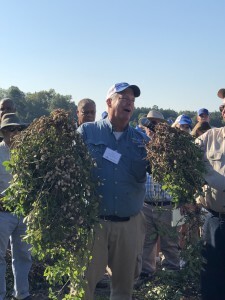 Dr. Bob Kemerait showing tour attendees what TSWV looks like on peanuts. One disease Dr. Kemerait and his colleagues focus on frequently is Tomato Spotted Wilt Virus (TSWV). According to Kemerait, TSWV is one of the most devasting diseases affecting peanuts. With his research, he is working to understand the relationship between the disease and the vector that spreads the disease, which is a small pest called a thrip. By understanding the relationship, he can create models to predict how many thrips would be in the field and how to best manage the spread of the disease. Dr. Kemerait also studies how other factors affect TSWV such as variety, use of in-furrow insecticide and planting date. Another aspect of his research is the use of fungicides for disease control. 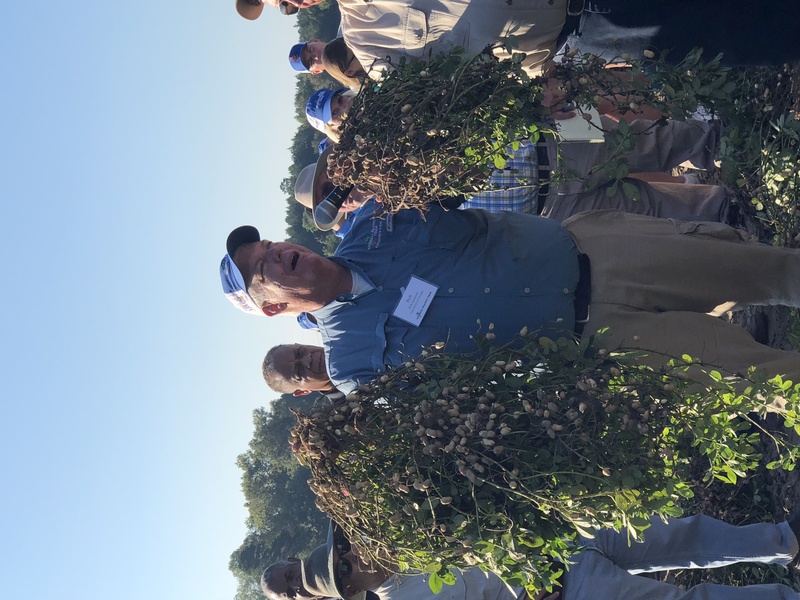 Diseases such as leaf spot and white mold can take millions of dollars to control; however, Kemerait says if they are not managed properly, they could cost tens of millions of dollars in yield reduction from the peanut crop. Kemerait says if growers want to remain profitable, they know they have to fight diseases by taking the research produced at the University of Georgia and integrating it into their production practice, as well as being “upfront” about prevention.